Charles Tupper was premier of Nova Scotia during the negotiations for Confederation. He attended the Charlottetown and Quebec Conferences of 1864. Opposition to Confederation in Nova Scotia crossed party lines and was led by newspaper owner Joseph Howe, the "father" of responsible government in the province and an influential force there. 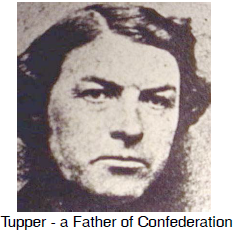 Tupper knew he could not win an election on the issue of Confederation and urged the other colonial leaders to complete their union before he had to face an election in 1867.